How often do you go shopping? How many plastic bags do you end up lugging around and stowing in some dusty cabinet at home? In our household, we tend to collect lots of plastic bags as they are often the default packaging that shops here use. We do try to make the best of the situation by re-using the plastic as trash bags, so we rarely have to buy trash bags. I know it is not the best solution, but it is better than throwing away all the “unused” plastic. If Puma’s new idea takes off, though, shopper might not be burdened by excess plastic bags anymore. While many shops have resorted to paper bags, Puma has decided to do something clever. Now I am not against paper bags – I have my own collection as well – but this invention is pretty ingenious. 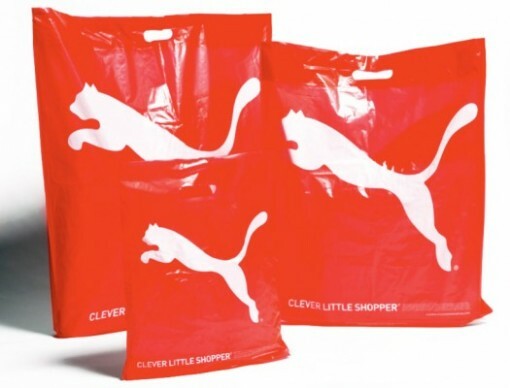 Puma is now using biodegradable shopping bags called Clever Little Shopper. The bag is made primarily from cornstarch, and all other materials are also 100 percent biodegradable. After use, the bag can be placed in a compost heap. The bag will then decompose naturally in the period of about three months. Now if you are not a very patient person, you can actually speed up the process by dissolving the bag in water! There is the worrying idea of the bags melting away in rain, or perhaps water condensing on a cold bottle. The last thing that anyone wants is a melting bag with stuff falling all over the place! They say, however, that the bags will NOT dissolve in cold water and that hot water is needed for the material to disintegrate. In any case, this could be one solution to the over use of plastic bags which only add to the problem of non-biodegradable waste. Here’s a video about this clever little thing. I have to admit, though, that I have my doubts as to whether the idea would quickly catch on. I suppose it will all boil down to cost and consumer demand. What do you think of the concept? Spread the word if you think it’s worth it!